A step-by-step guide to divorce and money. THE BOOK ... DIVORCE STRATEGIES, MONEY MATTERS AND MORE! 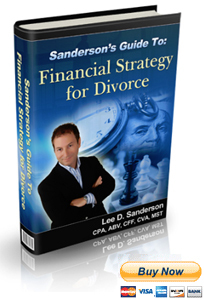 In this essential guide for anyone going through a divorce, financial expert Lee D. Sanderson, CPA, ABV, CFF, CVA, MST shares his years of experience working with some of the nation's leading divorce lawyers on divorce financial strategies directly with you. Filled with the information you need to make sound decisions, Sanderson has taken expert strategies, simplified them with easy to use worksheets and action plans and made them available in this step-by-step guide. Divorce can be one of the most devastating experiences people ever go through, both financially and emotionally. It's filled with uncertainty about your life and your financial future. As difficult as this time can be, your best strategy is to educate yourself and approach your divorce well informed and prepared! • The money available to start a new life and much more. Many people find out too late that they could have ended up with more money, property or income if they had better information about divorce and money. So, it's in your best interest to prepare well and apply sound financial strategies early in the process. Avoid costly mistakes and take charge of your financial future today. "As a financial expert in this area, I work with many people getting divorced each year. Some of the most common questions I hear are:"
•	Can I afford to stay in my home? •	How can I get through this divorce without losing my shirt? •	How much will my divorce cost me? •	Can I even afford to get divorced? •	How much will I have left over to begin my new life? •	How much will I pay / receive in child support or alimony? •	What can I do to maximize my financial settlement? •	Is my spouse hiding money? •	I know my spouse makes more money than the tax returns show. Will I lose out on support because of this? •	My spouse says his/her business is not worth anything. How is this possible with the money it makes? •	Are there any ways to save money in this process? This guide was written to provide you with answers to many of these questions. Preparation and knowledge of financial strategy for divorce will not only give you a strategic advantage, but it will also make this difficult time much easier. "Finally....a book that is different than the others I have seen. It is written by a financial expert who works with top divorce lawyers giving me confidence in the source. Is filled with genuine, useful strategies and explanations. This should be required reading for anyone getting a divorce." "A tremendous resource! I learned how to organize my finances and to approach the financial part of my divorce strategically. This should be required reading for anyone getting a divorce." "With this book, I was able to interview lawyers with confidence. Loved the section with questions to ask attorneys!" "After reading this book, I felt much more empowered going into my lawyers office." "The idea of a divorce was extremely scary and overwhelming. This book broke down the financial aspects of what I needed to think about to help me get through one of the most difficult times in my life." "Most other divorce books I have seen on the internet were just not credible. They were written by people unqualified to offer information and claimed to offer "tricks" and "secrets" about divorce that I found to be questionable. This books contained credible and practical information." I am so confident you will find this book to be a valuable resource, that I am making this book a risk free purchase. If you are not satisfied that these divorce strategies can help you save time, money and approach the financial aspects of your divorce well informed, you can return the book for a full refund. To read a free chapter, click here. To make your purchase as easy as possible and to provide you with the information instantly, the book is available on this website for instant download. To purchase this book, simply use the link below and you will be taken to our secure server. 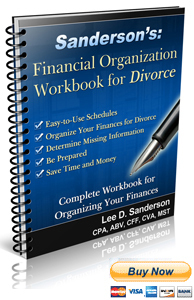 As an additional benefit, if you purchase today you will receive a special discount price for Sanderson's Financial Organization Workbook for Divorce. To learn more about this resource, click here. The divorce strategies in this book have saved people thousands of dollars in their divorce. If the worksheets and other resources save you even one hour of lawyer time, ($200 - $500 per hour) this book will certainly prove to be a worthwhile investment for you and allow you to approach your divorce well informed and prepared. Sign up now to receive e-mail updates on seminars, discounts on new books and more.